Each year garden owners donate their personal gardens and properties for display during the Waiheke Garden Festival weekend. The Garden Festival committee and the Jassy Dean Trust are grateful for their time and effort to help make the Festival a fun and informative weekend for all. The Annual Jassy Dean Massive Plant Sale has changed and Ngaio Lewis, one of our long time plant growers, will be selling plants from her garden. This new format gives gardeners the opportunity to purchase plants in their prime condition ready for planting at the right time of the year. This mini-sale will be held at Ngaio Lewis's garden at 403 Seaview Road at the corner of Brown Road from 9am to 2pm. Plants on sale will include Hibiscus, in prime condition for planting, and a wide range of natives including Nikau Palms, Flaxes, Native Clematis, and many other native varieties. There will be a large range of Bromeliads, Citrus, Jacaranda, Datura, and other plants. All proceeds benefit the Jassy Dean Trust. The garden is set in a 2 hectare olive grove. The olives were among the first planted on Waiheke in the 1990's. Many varieties were planted to test which would be most suitable to Waiheke's conditions. An orchard of apricots and apples was planted at the same time. The garden around the house was designed by award winning Natural Habitats Landscaping. Their brief was to keep it simple to reflect the design of the house and also low maintenance as there is already plenty of work to do on the property! Like all gardens ours is very much in progress! Although our names are on the title we are just the guardians of our lovely, flat, beachside property which we have been nurturing since we moved here 6 years ago. Our vision is to create a garden which engages all the senses. Not just beautiful to gaze upon but also trees and foliage, birdsong and a bubbling fountain, scented vines, bedding flowers and importantly veggies including fruit & berries for the palate. Many components go towards realising this vision including compost systems, permaculture techniques and of course the knowledge and advice of others especially Lyndell Shannon of Gardens Realised and also the ladies from the Waiheke Garden Club. We were very fortunate to inherit a much loved garden and during the last 14 years we have continued developing and changing parts of it as and when we have been inspired to do so, there is, however, no grand plan! Although the garden is not large there are a number of pathways from which the various areas can be discovered and appreciated, along with beautiful northern sea views towards Little Barrier Island. We enjoy the diversity of plants we have and there is certainly more emphasis on form and foliage than on flowers. Our raised bed vegetable garden provides us with herbs, salads and a variety of vegetables throughout the year a composting area nearby. Since this is a mature garden most of our gardening time is spent on keeping the constant growth in check. A particular delight is the water feature and while children are welcome parents please be vigilant in this area. We also ask that children do not touch or climb on the sculptures for safety reasons. The original name of the property was 'Peace Haven'. It certainly has become our peaceful haven and we hope you enjoy your visit. Our garden is less than a year old and is very much in its development phase. The design concept was created by Robyn Shafer of Orewa in conjunction with ourselves incorporating Council requirements that we had to include a number of natives. The Springfire pohutukawas fringing the driveway and a single kowhai are the only plants remaining from the original planting. We were able to obtain some mature Chatham Island Nikaus, Lepidozamias and Macrozamias which we augmented with a selection of other palms and natives. There will be additional underplantings of bromiliads and other colourful plants. We sourced mature grass trees from Western Australia and Mexico. On the northern and eastern boundaries are a variety of succulents, grasses, aloes and some cussonias. 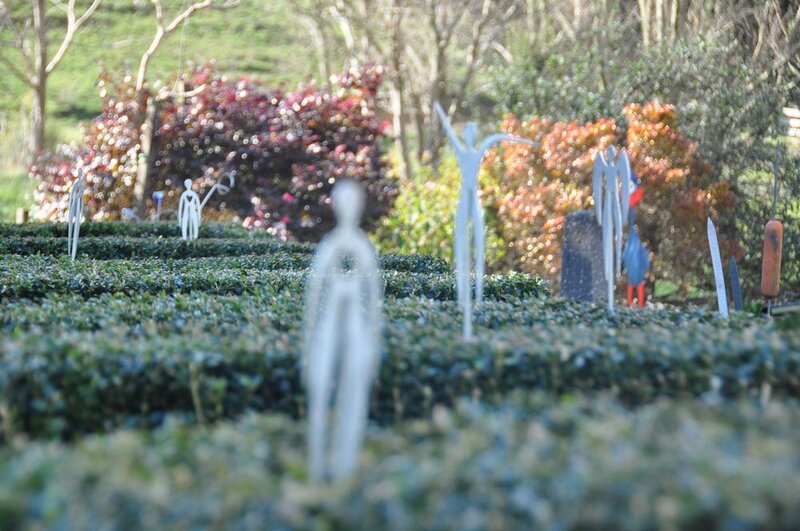 Scattered around the property are a number of sculptures by some of the countries well know artists. All the work has been carried out by the team at LSG Landscaping. Enjoy the stroll and check out the view from the window in the fence. Our garden has been developed over the last 20 years. It has been a long slow process but also very rewarding. We have encouraged native plants at the front of the house, namely punga, nikau, pony tails and manuka. A manicured lawn at the back surrounded by bromeliads, lily's, flaxes, native grasses and ferns, with larger natives defining the boundary. The garden is tranquil and and private with abundant birdlife. It is our own little haven for peace and reflection. This road is very narrow and parking is limited. Parking attendants will help you park safely. Within our valley , we have built a variety of gardens of different themes within our micro climate, you need a will to survive here with temperatures between -5 to 35 degrees. Pockets of artwork and scarecrows can be seen as you wander between the vegetable or bromeliad garden to the shade house or mini orchard. Native birds are attracted and complement our own bird life in our aviary. A work in progress over 13 years that continues to evolve. Our garden is shared with friends and family, the birds, ducks, chickens, goat, rabbits and pheasants along with flowers for strangers, a shared garden and a good life. Babicka's Table on hand with hand crafted sausages and Island Fudge serving delicious homemade fudge.